This is my childhood favorite sweet flat bread :). 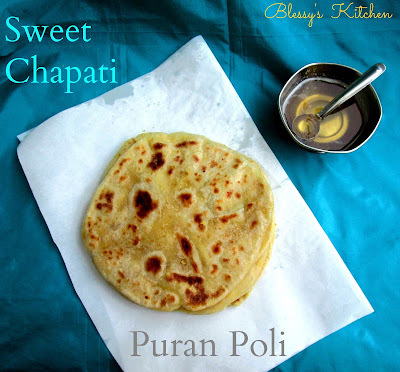 Am very happy to post this recipe because now, I can make this on my own without others help.This is my first try on Sweet Chapati/ Puran Poli and they turned out to be so delicious. 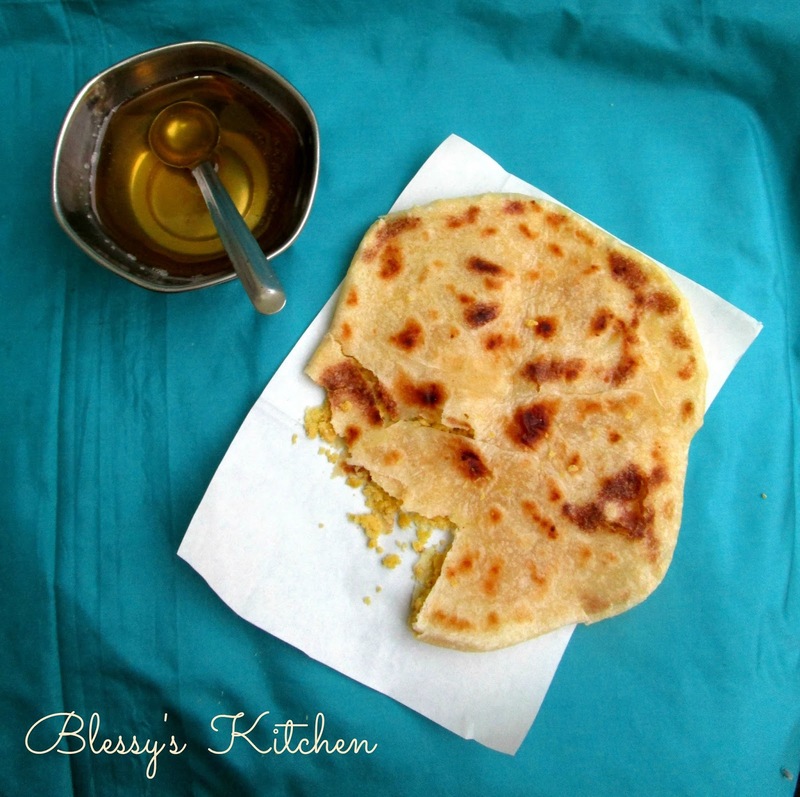 Soft bread coated with ghee (clarified butter) and sweet filling with cardamom flavor, ummmm!! This delicacy is made in many parts of India. So the flavorings and names vary from place to place. Today, I have used the default, basic, green cardamom powder to flavor my puran(sweet lentil stuffing) while others use dry ginger, star anise, cinnamon, fennel (saunf) to flavor it. 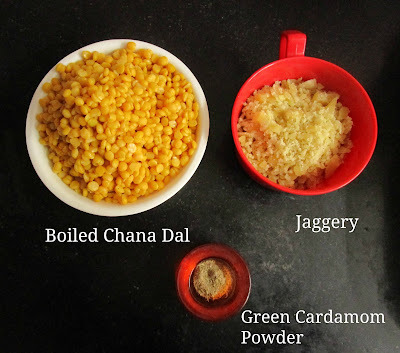 I have used Chana dal (Split bengal gram) and jaggery to make the puran, Gujarati's use Toor dal(Arhar, Pigeon pea), sugar or jaggery for the puran. I also learnt, these are served with vegetarian curries! It's a big no for me. I have these with ghee and hot milk or simply on its own. Anyway, that's up to you, how you wanna eat! I grew up calling these as Sweet chapati. 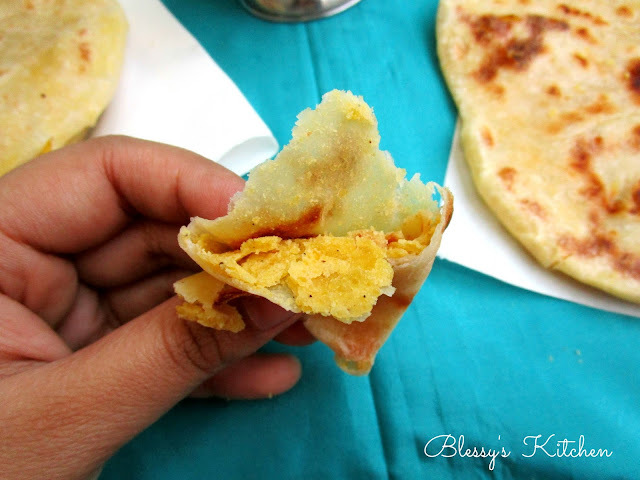 But, these are widely known as Puran Poli. Puran = sweet filling, Poli = the outer covering. 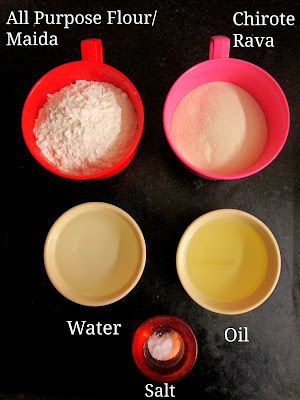 If you are a beginner, follow the given steps carefully and succeed in making these yummy polis. Now I don't need to wait for a festival to come, its a festival when ever I make them!! 1. 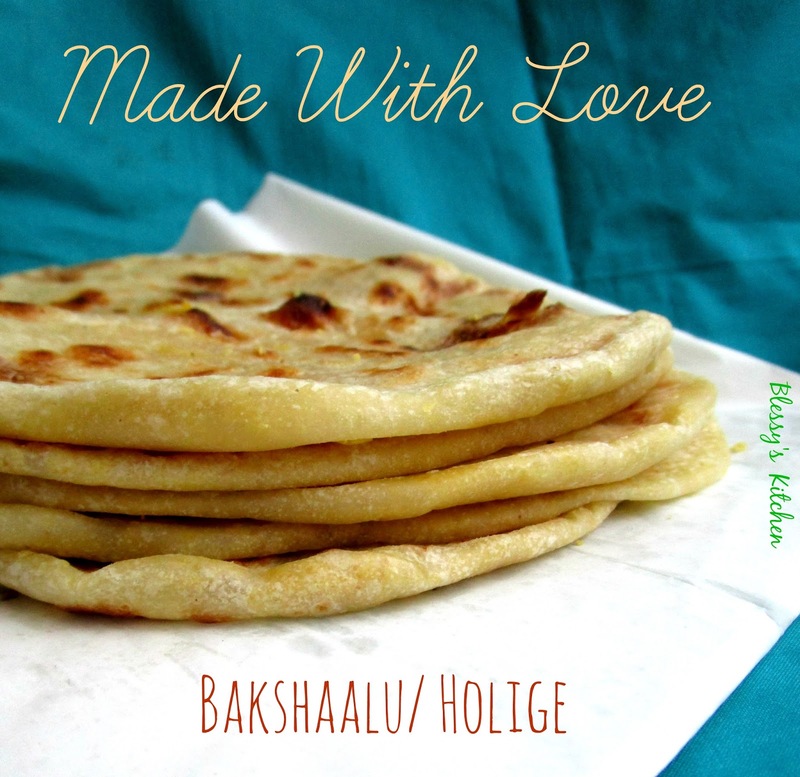 Add all purpose flour/ maida, chirote rava, salt and mix well. To this add enough water and make a soft dough. To this add the oil and continue to knead it for about 10 minutes (By this time oil will be absorbed and the dough becomes soft). 2. Cover this dough and rest it for about 2 hours. Cover this dough and rest for 2 hours. 1. Cook the soaked split bengal gram/chana dal in the pressure cooker for 1 whistle and place the hot pressure cooker under the cold running water. This is to stop the cooking process of the dal. We want the chana dal to be cooked yet retain its shape. In my case, I soaked the dal over night and in the morning I cooked it on low flame for 15 minutes. Check the below pictures to know how dal should be after cooking it. The dal should get mashed when pressure is applied. That's how you know its cooked and ready to be converted into Puran. 3. Once your dal is moisture free, add the dal and jaggery to a food processor or mixer jar and make it into a smooth paste. 4. To this paste add green cardamom powder/elaichi powder and mix well. This paste is called Puran. Add Elaichi and mix well. Puran is ready..
Once your dough and the puran are ready, it's time to make the Puran Polis. 1. This is very simple. It's just like making any kind of paratha's you make at home/ any stuffed flat breads. 3. Dust the board, place the dough ball and make a small circle. To this add the Puran ball and cover from all the sides. 4. Flatten this stuffed ball with your fingers lightly, moving from center to the edges so that the puran spreads evenly inside. 5. With a rolling pin, gently roll it into a flat chapati. Remember no pressure during this process. 6. Now, roast the puran poli on a medium hot tawa/pan on both the sides. 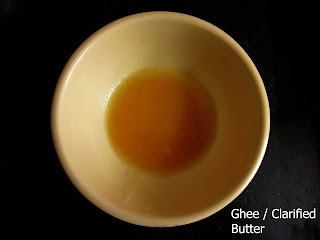 Remove and apply ghee/ clarified butter on both the sides. 1. If chirote rava is unavailable, use fine semolina or grind the regular semolina at home. Or you could use only maida for your polis. Health conscious pals can use wheat flour. 2. After you strain your dal, use the dal water in the preparation of rasam, sambar , dal etc. 3. You could apply ghee to the puran polis while roasting them or apply after removing from flame. I liked the second method. 3. After grinding dal and jaggery together, if you end up with a liquidy puran , then simply cook the puran on stove until it thickens up. If you over cook your dal, this is the extra step you have to follow!! I hope this post will help you in making good Puran Polis. Ping me on my facebook page if any further help needed. That's all for now. Bubbyyee. Take care!